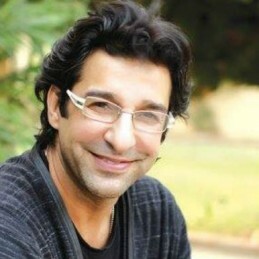 Wasim Akram is a great of Pakistani cricket. A left-arm bowler and batsman, he is well-regarded as one of the greatest genuine pace bowlers in world cricket history. Wasim is one of the originators, and perhaps the finest exponent, of reverse-swing bowling. His 881 list-A wickets are a world record and his 502 one-day international wickets is second only to Muttiah Muralitharan. During the 2003 World Cup, Wasim became the first bowler to reach 500 wickets. In 2002 Wisden released a list of the best players of all time with Wasim ranked the best one-day international bowler of all time. In September 2009, Wasim was forever immortalised with his induction into the ICC Cricket Hall of Fame. Following his retirement, Wasim carved a fine media career with commentating roles for the major networks in the sub-continent. Wasim is also a polished and articulate guest speaker.